Today's post is one that I wish I never had to write. I wish the thing I am about to talk about didn't exist. And I wish upon wish that I didn't know someone who has suffered this heartache. I'm talking about Sudden Infant Death Syndrome (SIDS) and it absolutely rocked my world when I learned that a former sorority sister and her husband suffered this loss only 27 days after the birth of their first son, Bo. In my limited knowledge of the topic, SIDS was something that could be easily prevented by laying your baby on their back while sleeping and making sure their crib was free of loose blankets. I also assumed that it was something that was so awful it could never possibly happen to anyone I know. It's just proof that life. isn't. fair. From this tragedy, 27 Blue Balloons was born. Lori writes posts honestly, beautifully, and from the heart. I know many of the posts on her blog have been absolutely devastating for her to write. I also know that people every day benefit from the strength that she displays on her blog with every post. 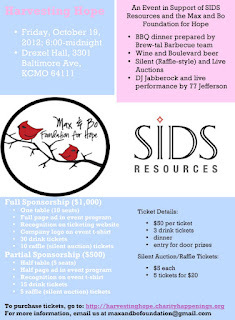 Lori, her husband, and another couple who also sadly lost their son (Max) to SIDS have put together The Max & Bo Foundation for Hope and are having a fundraiser in Kansas City on October 19, only a four days after Pregnancy and Infant Loss Remembrance Day. For the first time in the history of this blog, I am asking you to consider donating to a cause. I know donating money to this cause won't erase the tragedy and sadness that is SIDS, but I have never felt so powerless over anything before in my life, and I would really love the ability to ease some of the sorrow and pain that families suffer when they lose a child. It's actually something I probably didn't give a lot of thought before I knew someone who went through this. You are able to donate to this cause even if you aren't able to attend the event (and I don't know how many of my readers live near the KC area anyway.) There will be a link on my sidebar leading up to the charity event. I hope that you will consider donating and also consider reading a few posts from Lori's blog. Most of them I have not been able to read without tears streaming down my face, but I continue to be absolutely amazed by her strength at every turn. Just one of many sad aspects about this is that you never know when it will hit close to home.